In an alternate world where New England is overtaken by a strict and religious brotherhood, witches are being hunted down and killed, or at the very least, sent to the madhouse. Many innocent girls meet their doom as the Brothers search for the real threat to their rule. The real threat that is sitting just outside of town. Cate Cahill is insistent upon watching over her sisters. Confronted with a love triangle, a new governess, a meddling neighbor and an absentee father, she sees her tightly-wound world fraying away. After her mother, a witch, died, leaving Cate in charge at just 13, the girl has had to protect herself and her younger sisters (all witches) from the hands of the brothers. It's a compelling story, and Spotswood does incredibly well with conflict and climax. The last third of the book was a creative page-turner. Some of the events I saw coming a mile away, but at 29, I'm hardly the audience for YA, and even seeing the plot turns before they occurred didn't ruin the experience for me. I've seen people complain about the romance aspect. I don't understand that. I think Spotswood did a really great job with Cate's love-life and those sections (up until the end, as I mentioned) were, in my opinion, the best done by far. There are so many complex themes riding together, and I am really impressed with her ability to pull them all off. 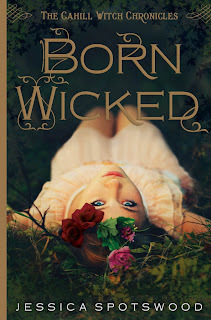 Normally, you have a bad guy and a good guy, but in Born Wicked, who is who? She pulls off that question over and over again, until your head is swimming. Well done. The biggest weakness I saw within the book, and one I may have put it down for eventually is the repetition of this theme: "No matter what, I must take care of my sisters," or "I will make any sacrifice for my sisters." After the third time, I got it. By the 75th time, I was about to put the book away. However, perhaps the YA audience needs those reminders? Anyway, it wasn't enough to sour me on this book, and if you can over look a sentence or two here and there telling you yet again how devoted she is to her sisters (an important plot point, but overkill), you will really enjoy this book. It's got love, drama, excitement, witches, family issues and mystery all at the same time. I will be reading the second book, for sure. And I'll be discussing it for quite some time. If you'd like to join in the discussion, head over to the BlogHer book club! It's lively and fun in there. I thought the same way about this book! Lol, I thought I was the only one who wasn't all that amused by Wings of the Wicked. Ellie annoyed me throughout the entire book. She broke down crying every other chapter.